Weeyos Design 2006 18 72 7125 60 minutes from downtown. 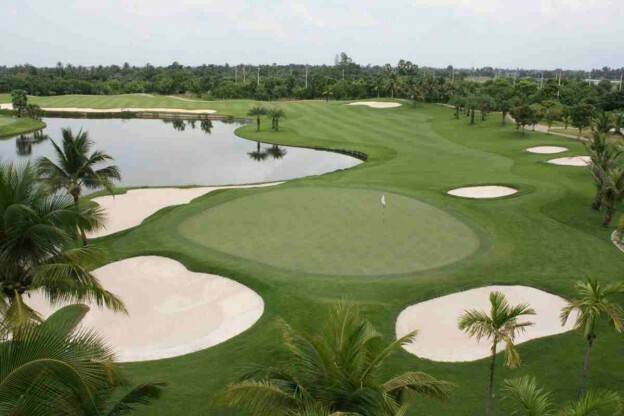 Suwan Golf and Country Club was opened 2005 and is the home of a very challenging golf course. The hilly layout and sloping and speedy greens remind you why the course is rated among the best ones in Thailand. The course has been part of the Asian Tour International at several occasions with the latest event taking place in February, 2010. Suwan Golf and Country Club offers three separate practice greens for fine-tuning of your putting- and chipping before tee-off. There is also a driving range available. The top-class club house offers a full-service pro-shop with the best known brands in golf. At the Suwan Nava Restaurant you can experience casual dining with a wide selection of international dishes while enjoying the view of the lake and golf course. Suwan Golf and Country Club is located only 45 minutes from downtown Bangkok and is the perfect location for a pleasant round of golf with friends or clients.